AMW Reports: Garnier Pure Active Launch and Fans Day! When Major of Garnier Philippines invited me to be one of his guests for their Garnier event at the Robinson's Equitable Tower in Ortigas, I immediately checked my schedule and was glad my schedule was open and I said YES right away! I braved Saturday traffic and didn't know what to expect when I arrived! I can see a lot of reds and blues to represent the launch of Garnier Pure Active while I'm glad to still be part of the "theme" as I wore the original Garnier color - Green! And who've thought today will be the day I will have a face to face encounter with Ms. Georgina Wilson? The gorgeous face of Garnier Pure Active! Let me start from the beginning and share to you what happened! The event was hosted by Junior Product Managers Arlene and Major! 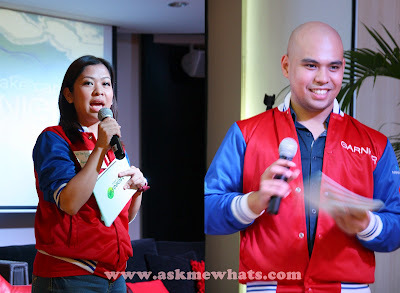 If they did not wear the Garnier jacket, you would've thought they were professional emcees! Kudos to them for the great hosting skills, I can't count the times I've laughed! 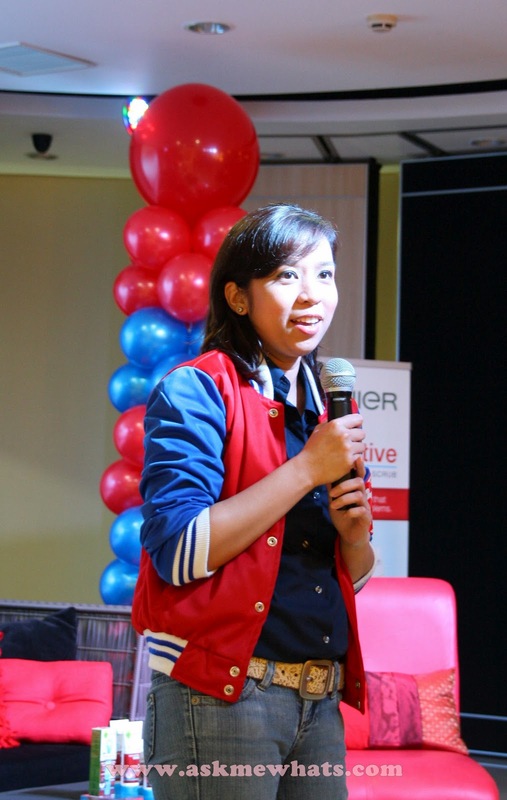 Garnier Philippines Brand Manager, Barbara Ramos, welcomed everyone to the intimate gathering of Garnier fans from both Facebook and Twitter! Amazing, Garnier took time to prepare this special day specifically for Garnier Fans! I can see the "jive" the team got with the fans! It was like they've been friends forever! I was told that the event was prepared in a rush and it was just a sudden idea over lunch by the Garnier team to create fans day, seriously speaking, I can't tell! The decors, registration service, hosting, slide shows and video presentations are done so seamlessly I would think this event was prepared for months! 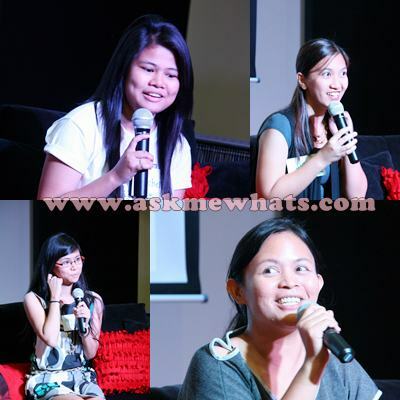 To break the ice, a "Pinoy Henyo" (Filipino Genius) type of contest was done wherein contestants ask various questions and audience can only answer "Yes", "No" or "Maybe" and the contestant will guess the answer! It was mostly about Garnier products and everyone who joined took home a Garnier loot bag filled with Garnier goodies! 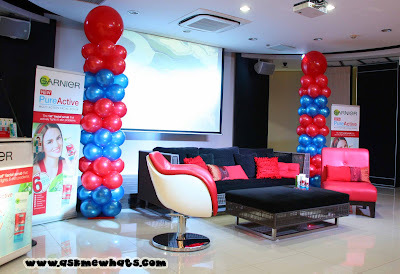 Then the unveiling of the new line of Garnier Product called Pure Active! Who would've thought on a busy Saturday afternoon like this, THE GARNIER PURE ACTIVE Model Ms. Georgina Wilson would appear in front of us and stun everyone with her beauty! Georgina shared to us her experiences on pimples and how pimples could ruin anyone's day! I was even randomly asked a question on how I deal with it if a pimple appeared just in time when I'm going out for a date. I sheepishly answered: "I would probably lie and reschedule for another date!" Georgina laughed and exclaimed: "See? Pimples can turn us into liars too!" The day after is also Georgina's birthday so she was surprised by Garnier staffs with flowers and cake and everyone sang her a birthday song! Off we went to have our photos and videos taken! Then buffet dinner was served and everyone went home full, happy and met a couple of new friends! 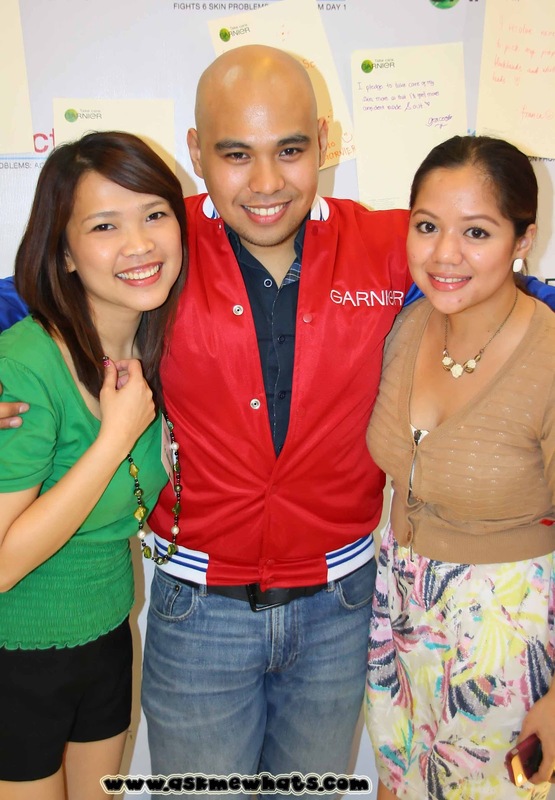 Congratulations Garnier Team for the successful event! Thanks Major for the invite, Shen and I had loads of fun!!! I guess the products would suit normal to oily skinned! 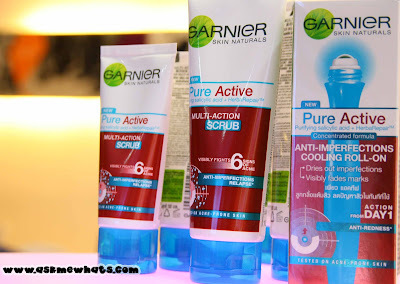 Anyone seen the Garnier Pure Active Line? Have you tried Pure Active? Do you like it? I've seen this product in Shopwise for quite awhile now. I have yet to try this product soon. Lucky you! I've always wanted to meet her! Achie Parang batang bata ka sa shorts mo ah! hahahhaha well the ever so radiant me is nothing beside the EVER gorgeous GEORGINA! grabe super ganda! hahahaha baka sa picture lang! hahahah :) Thanks for saying it though! made my night! Georgina is super gorgeous!!! I have the pure active roll on, quite like it because it's so easy to use, especially when you are really lazy!